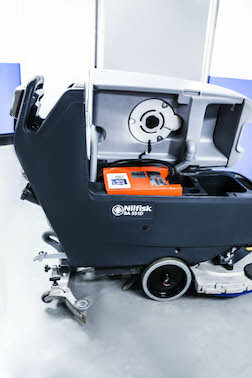 EnSol lithium-ion batteries for cleaning equipment allow to significantly increase the useful life of floor cleaning machines and industrial vacuum cleaners thanks to quick charging and longer lifetime in comparison with the conventionally used batteries. The principal difference of the EnSol batteries is the possibility of fractional charge - during technological and lunch breaks - without losing the battery reliability and efficiency. The equipment availability increases by 60%, and battery replacement and repair expenses are absent! Thus cleaning companies begin to more effectively use its equipment stock and not to worry about its maintenance. Another important advantage of using EnSol lithium-ion batteries is its safety - batteries have passed all environmental tests and can be used in crowded places, as well as at facilities related to food.